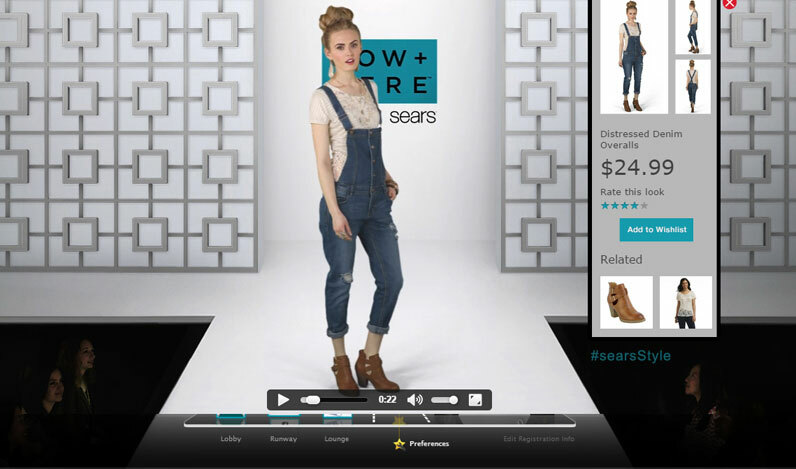 With a bold and forward thinking plan to increase revenue by expanding marketing presence and product awareness, Sears engaged with Design Reactor and 6Connex to build the world’s first interactive runway show. In our increasingly digital world where consumer's online shopping presence continues to grow year over year, it is important to consider the overall digital shopping experience. Since consumers select their purchases based on flat static product images and are often times left unsatisfied with their online shopping experience or the end quality of the product they selected, we re-imagined the online shopping customer experience journey to include 3D, live modeling of the retail clothing and accessories Sear's users were shopping for. By elevating the digital concept of 'hanger appeal' to the next virtual level, the Sear's spring fashion show allowed consumers to see the clothing on the rack, on the model walking the runway, and ultimately see it in their cart with the integrated 'Buy Now' capability - hot off the runway into the users shopping cart. The online fashion show promoted the launch of Sear's 2013 'Now and Here' shopping campaign, ultimately allowing users to interact with a digital shopping experience inclusive of a virtual fashion show to view the latest trends and looks from Sear's top fashion lines. 6Connex provided the virtual event platform while Design Reactor lead the design and strategic customer experience analysis, sparing no expense for selecting the model talent, designing the virtual runway, and filming the model's live action sequence on a green screen runway. Design Reactor also innovated a custom shopping widget as part of the runway experience that allowed users to interact with pricing, color, and product details of each model's outfit as soon as she stepped foot on to the virtual runway. Of course no fashion show would be complete without audience members clapping in the background, a finale walk, and celebrity appearances, so too did the interactive platform offer these in-browser features (inclusive of live chat with Hollywood's own Brooke Burke-Charvet) ultimately creating a customer experience journey that made the user feel like they had front row access to the spring fashion.